Tablets and smartphones are great! They allow us to communicate with distant friends and relatives, they organize our day, have GPS that gets us to new places, help us make reservations, shop, read, and much more. They contain an infinite number of applications that even include an extensive catalog for children. Allowing or banning screen time for babies poses an ongoing debate that is very present in the area of early education. Should babies be exposed to screens? If so, for how long? The American Academy of Pediatrics’ (AAP) first stance regarding technology and babies was no screen time the first two years of life. However, this position was first introduced 15 years ago, and today it has come to be questioned by specialists in the area of pediatrics. The AAP media committee has re-evaluated its screen time position taking into account the recent technological boom. They now agree that a total screen ban is no longer viable. Therefore, a change in the AAP’s digital exposure guidelines is predicted in the coming years. Technology changes every day and whether we like it or not, it’s part of our daily life. It has become part of our reality; our children see us use our smartphones and tablets every day, and, remember, they learn through imitation. For this reason, we need a new way to define and use these tools –which is what they are, tools. We need to ensure that when our children are exposed to screens, we provide them with appropriate applications and interact with them, so their experience is the most educational and social as possible. Before they reach two years of age, our little ones experience a learning boom. Research has verified that they learn best from face-to-face interaction and understand our language even before they can talk. Therefore, talking, reading, playing with your child, and allowing free movement will help him or her develop linguistic, cognitive, and physical skills; as well as coordination, visual perception, and much more. Screens can’t replace these valuable learning experiences. Even though technology provides sounds, images, and voices, it can’t sustain a two-way interaction. That is, if your little one smiles, the device can’t smile back at him, but you can! As simple as it may seem, social interactions help your kid tremendously and provide a wonderful opportunity for bonding. Now, thanks to all the advances in technology, there is a way to have enriching social interactions through platforms such as Skype and FaceTime. These apps allow our babies to come in contact and learn from loved ones who can not visit them in person. This type of screen use does provide two-way interactions and facilitates learning and social interactions, while other apps only provide a distraction. Scientific studies regarding technology are complicated because technology is constantly evolving. Publishing a scholarly study can take up to four years. By that time, the world of apps children come in contact with have already changed drastically! For this reason, it’s not clear if screen time before two years of age represents any harm or benefit for kids. What we do know is that they, like us, are increasingly exposed to screens. The problem is that most of their apps ask for passive attention. Knowing that babies learn best when active, we should look for appropriate apps that are educational, and make the time spent with them be interactive. How can I choose truly educational apps? 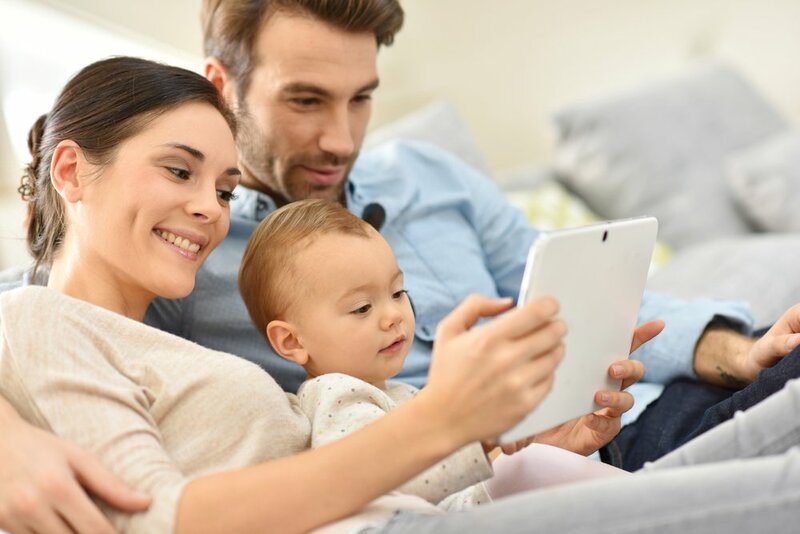 Before allowing your little one to use an app on your phone or tablet, judge its content and verify that it’s: active, entertaining, meaningful, and social. Active: Invites participation within and outside the app. Entertaining: Your child is engaged –it captures his attention. Meaningful: The app’s content can be related your child’s real life. Social: Invites there be face to face interactions (talking about the app or communicating with others via a platform).